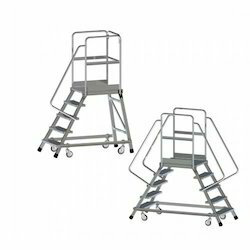 Our range of products include collapsible platform steps ladders, telescopic platform ladder, single & double-sided access mobile platform ladders, single & double-sided access mobile work platforms ladders and warehouse platform ladder. Platform steps for working at a height of upto 3.20 m.
Large comfortable standing surface with guard rail for safety. Height-adjustable in platform heights of 0.40 m / 0.80 m / 1.00 m & 1.20 m.
Comfortable height locking by means of foot lever. Large steps for safe access – steps are horizontal at every lockable height. The platform can be pushed thanks to two lockable castors. Pull-out locking castors as stabilisers provide for maximum stability. Telescopic Platform Ladder offered is ideal for accessing lofts, for cleaning high rise windows as well as in high rise interior and exterior areas. 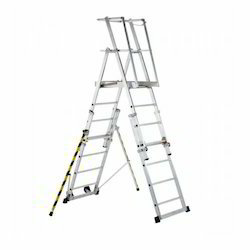 A practical single-sided or double-sided mobile ladder that can be used anywhere. 2 fixed castors, dia. 125 mm. Spacious platform: 600 mm × 800 mm. Platform railing 1.10 m high with intermediate & toe board. Delivered in sections that are easy to assemble. Maximum load capacity: 150 kg. Conforms to EN 131, BGI 694 and BGI 637 - 2004. Access handrail, to be mounted 0n either the right or left, stipulated from a platform height of 1.00 m.
2 pieces for single-sided & 4 pieces for double-sided mobile work platforms. A safe and comfortable workstation for a range of applications. Tread depth: 200 mm. Standing platform: 600 mm × 800 mm. Guardrail height: 1.00 m.
4 sprung swivel castors with lock on request. Handrail from 1.00 m platform height. Conforms to BGI 694 and BGI 637 - 2004. Anti-static ladder end caps and castors. 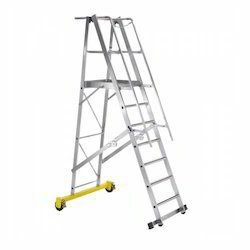 Ergonomically designed ladder with large platform for safe standing. Stand without getting tired on 80 mm deep treads. High strength triple formed connection between rungs and stiles. Support section with horizontal stabiliser and castors with locking mechanism (160 mm diameter). Aluminium work platform, approx. 600 mm × 630 mm, with three-sided safety guard rail. 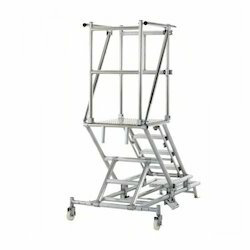 Hinges on both diagonal struts allows the ladder to be easily folded and put away to save space. 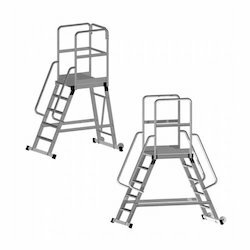 2 handrails to ensure safe use of the ladder automatically lay on top of the ladder when packed. Looking for Mobile Work Platforms ?